Program Description: MBA Sustainability and Environmental Compliance - Program Overview Learn about the environmental challenges facing businesses today and how those challenges influence decision-making. Help your organization comply with constantly changing environmental laws and achieve sustainability goals. Discover how to build support for ecological strategies that make economic sense. Learn how to be an advocate for positive change not only at work, but also at home and in the community. Introducing Southern New Hampshire University’s MBA in Sustainability and Environmental Compliance — one of the most affordable MBA programs in New England. MBA Sustainability Online - Taught by Environmental Advocates and Executives The MBA in Sustainability and Environmental Compliance online offers a classic MBA combined with courses that focus on a broad range of ecological and energy-related challenges and opportunities. Because our MBA in Sustainability professors bring extensive and broad experience to the classroom - as environmental advocates, executives and activists - they're able to provide a solid theoretical framework of the issues while offering current real-world examples of what they're teaching. MBA Sustainability Online - Accredited, Affordable, Convenient The MBA in Sustainability and Environmental Compliance is an accredited and affordable 39-credit hour program, offered on campus and online throughout the year. If you attend full time, you can earn your sustainability MBA in as few as 18 months. You are not required to take the GMAT or GRE to be considered for admission to this program. 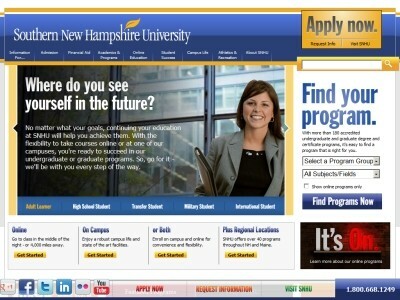 Founded in 1932, Southern New Hampshire University is based in Manchester, NH, with satellite campuses in Portsmouth, Salem and Nashua, NH, and Brunswick, Maine. Our online business programs, offered since 1996, have won several awards over the years, including Best of Business and Best Buy. Accreditation: . Location & access map for "Southern New Hampshire University"